The Minnesota Vikings opened the 1971 season on September 20 as they faced their strongest NFC Central rivals, the Detroit Lions, in a Monday night game. Both teams had reached the postseason in 1970, with the Vikings topping the division for the third straight year (and first in the NFC/AFC format) with a 12-2 record while the Lions were the Wild Card playoff entry at 10-4. However, Detroit had lost six straight games to the Vikings, the team they needed to beat if they were to rise further. Minnesota was entering its fifth season under the direction of Head Coach Bud Grant and was known for its rather plodding offense and strong defense. 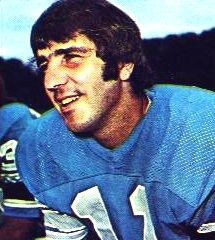 QB Gary Cuozzo (pictured above) was adequate, at best, and while Norm Snead had been obtained from the Eagles to challenge him for the starting job, he was still behind center for the opening game. The line was solid and the backs capable, although they lacked speed. The strength of the rugged defense was the imposing front four of ends Carl Eller and Jim Marshall and tackles Alan Page and Gary Larsen. The Lions, coached by former star linebacker Joe Schmidt, were viewed as a team on the rise. QB Greg Landry was emerging as a talented passer who could also run effectively. Likewise, FB Steve Owens was up-and-coming and there were good veterans in the running back mix as well. Detroit had a noteworthy defense as well, and while the front line did not compare to Minnesota’s, the linebackers and backfield were at least as impressive. There were 54,418 fans in attendance on a clear night at Tiger Stadium with temperatures in the fifties. The Lions had the first possession and put together a long drive of 71 yards. 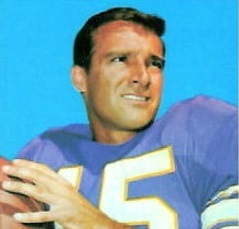 Greg Landry made two big plays carrying the ball rather than passing, gaining a yard on a quarterback sneak to convert a fourth down at the Minnesota 44 and then, facing a third-and-nine situation, taking off and running for 10 yards. HB Mel Farr also had a 17-yard gain but WR Larry Walton missed a pass in the end zone and the series resulted in a 20-yard Errol Mann field goal. HB Clint Jones fumbled on the ensuing kickoff and TE Craig Cotton recovered for the Lions at the Minnesota 21. Four plays later, Landry (pictured at left) rolled out to his right and tossed a three-yard touchdown pass to Farr. Mann added the extra point and Detroit was ahead by 10-0. The Vikings had yet to run a play on offense and when they did it resulted in another turnover as HB Dave Osborn fumbled and DE Larry Hand recovered for the Lions at the Minnesota 35. However, the Vikings held the home team to a three-and-out series and Mann’s 39-yard field goal attempt hit the crossbar and was unsuccessful. The teams traded punts as the game headed into the second quarter. Detroit put together a drive that featured Landry passing to Walton for 19 yards on a third-and-five play, but unable to get beyond the Minnesota 46, Mann’s field goal try from 53 yards was wide. The Lions got a break on defense when FS Tom Vaughn intercepted a pass by Gary Cuozzo, who was being pressured by Hand, and returned it eight yards to the Minnesota 28. A run was followed by two passes intended for Walton at the goal line that fell incomplete and resulted in Mann kicking a 36-yard field goal. Detroit was ahead by 13-0 with less than five minutes to play in the first half. The Vikings mounted a 60-yard series that resulted in a 13-yard Fred Cox field goal to finally get on the board with three seconds remaining on the clock and the halftime score was 13-3. Minnesota came alive on offense to start the third quarter, advancing 80 yards in five plays. Cuozzo threw to WR Bob Grim for 24 yards and connected with Grim again, who outmaneuvered CB Lem Barney and, after falling down at the two but not being downed, reached the end zone for a 45-yard touchdown. Cox added the point after to narrow Detroit’s margin to 13-10. A possession that featured Landry running for 14 yards on a second-and-10 play ended at the Minnesota 45 and once again Mann missed on a long field goal attempt from 53 yards. The Vikings punted after a short series and Barney returned it 13 yards to the Detroit 42, and from there on the next play, a nine-yard run by Steve Owens, the Lions gained another 15 yards due to a personal foul on the Vikings. Three more running plays got the ball to the Minnesota 21, but a holding penalty moved them back and, while a Landry screen pass to Farr gained seven yards back, Mann again was wide on a field goal attempt, this time from 36 yards. The Vikings had the ball as the game headed into the fourth quarter and Cuozzo completed passes to Grim for nine yards on a third-and-six play and to RB Oscar Reed for 16. RB Jim Lindsey picked up 18 yards on three straight carries and caught a pass for six more to set up a 42-yard Cox field goal that tied the score. 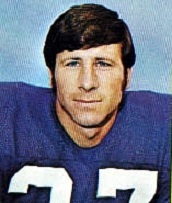 On the ensuing kickoff return, Barney was hit hard by FB Bill Brown, fumbled, and the Vikings regained possession as safety Karl Kassulke recovered at the Detroit 20. Cuozzo threw passes to Reed for seven yards and TE Stu Voigt for nine and, while the Lions halted the advance at the two when Vaughn alertly tackled Cuozzo, Cox put the visitors in front on a nine-yard field goal with 5:18 remaining to play. Detroit was unable to mount another threat until getting a break in the last minute when a facemask penalty added 15 yards to a punt return and gave the Lions first down at the Minnesota 45 with 46 seconds remaining on the clock. Landry threw to WR Earl McCullouch for 20 yards to get the ball to the Minnesota 25, but Mann missed yet again on a 33-yard field goal attempt and the Vikings came away winners by a final score of 16-13. Minnesota had the edge in total yards (275 to 221) while the Lions led in first downs (15 to 14). Detroit had the greater success running the ball (160 yards on 38 attempts to 43 yards on 29 attempts) while the Vikings were more effective through the air (232 to 61). Minnesota turned the ball over four times, with early miscues helping to dig the first quarter hole, to two suffered by the Lions. Missed field goals proved fatal to Detroit as the usually-reliable Errol Mann failed on five of seven attempts, three of which were under 40 yards, while Minnesota’s Fred Cox was successful on all three of his tries. Gary Cuozzo completed 19 of 32 passes for 232 yards and a touchdown while giving up two interceptions. Bob Grim (pictured at right) had a big performance with 7 catches for 126 yards and a TD. Jim Lindsey led the Vikings with 21 rushing yards on six carries and Dave Osborn gained 17 yards on 9 attempts but also caught 5 passes for 40 yards. For the Lions, Greg Landry had a rough performance, succeeding on just 8 of 26 throws for 61 yards and a TD with none picked off. He also ran the ball six times for 35 yards to rank third among the club’s ground gainers, as HB Altie Taylor had 51 yards on 13 carries and Steve Owens gained 45 yards on 12 attempts. Mel Farr caught a team-leading three passes for 14 yards and a touchdown in addition to six rushes for 23 yards. Larry Walton accumulated 22 yards on two receptions but had damaging drops as well. “We beat them physically but couldn’t put the points on the board,” summed up Joe Schmidt of the Lions. Minnesota lost the next week but then won five straight games on the way to another NFC Central title with an 11-3 record. The Vikings fell to Dallas in the Divisional playoff round. The Lions won four consecutive contests and were at 7-3-1 before dropping three straight games, including the rematch with Minnesota, to close out the season at 7-6-1 and again second in the division, but without a spot in the postseason. Bob Grim went on to have his finest pro season, catching 45 passes for 691 yards (15.4 avg.) and seven touchdowns. He was rewarded with selection to the Pro Bowl. Greg Landry recovered from his rough opening week to also gain Pro Bowl recognition as he passed for 2227 yards and 16 TDs and rushed for 530 yards, at the time a record for a NFL quarterback. Errol Mann survived the bad first week to connect on 22 of 37 field goal attempts (59.5 %) as well as all 37 extra point tries, for a total of 103 points, which ranked second in the NFC.